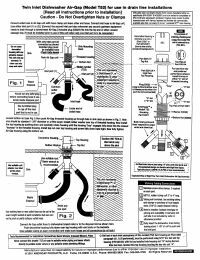 Dual inlet Air Gap is ideal for plumbing codes requiring Air Gaps for either Dishwashers and/or Reverse Osmosis Units! Simply insert 1/4" RO drain tube to the 1/4" Push-In fitting port and insert the Dishwasher drain line over the second barbed port. Accepts standard dishwasher hose 5/8" ID.